Fitness regimes don’t have to be put on the back burner during holidays, and wellness is very much at the forefront of a Villa Leelavadee holiday. In addition to the infinity pool, guests can make the most of the private home gym, which is kitted out with a handful of fitness machines, free weights, and an exercise ball. A built-in sauna attached to one of the guest bathrooms rewards all the hard work. A group of executives looking for an inspiring place to get down to business will find Villa Leelavadee the ideal getaway. A dedicated office space, plus a balance of outdoor and indoor areas cater for group brainstorming or personal creative sessions. When the work is done, the bond between team members can be strengthened over a game of pool or with social time around an al fresco barbecue or sit-down feast prepared by the live-in chef. 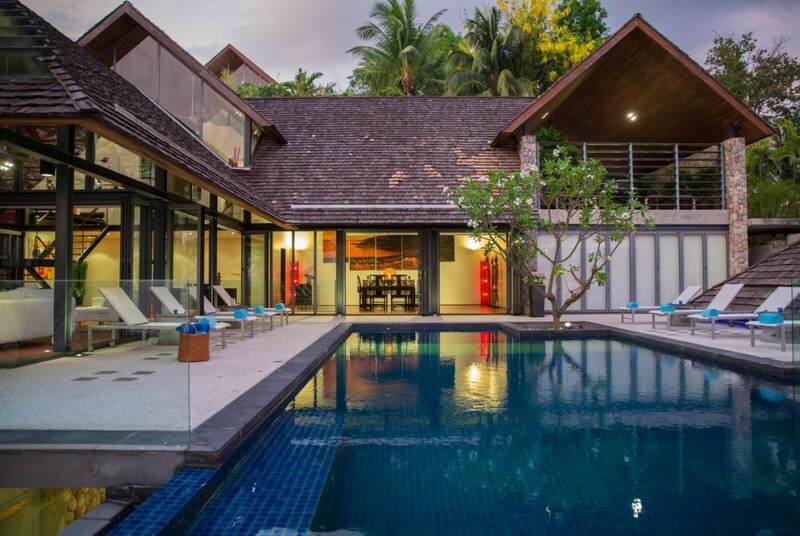 Villa Leelavadee is the ideal villa for a group of friends looking to celebrate an event, milestone, or just each other's friendship. The main living level opens up to become one seamless social zone with indoor and outdoor gathering spaces perfect for cocktails around the infinity pool or an al fresco barbecue feast. A pool table inspires friendly competition, while a projection TV in the home theatre invites laid back movie nights. Villa Leelavadee is a holiday home for the discerning world traveler that cleverly brings together the traditional with the contemporary. Built as a celebration of island sophistication, soft decorative wood accents and plush furnishings conjure up a genteel, homey ambience that beautifully balances the villa's modern character. A breathtaking ocean panorama dramatically unfurls as guests descend from the villa’s elevated entrance into the main lounge with views that take in a long crescent bay and extend out into the azure waters of the Andaman Sea. Making the most of the stunning tropical surroundings, a covered outdoor terrace has been added to the main living room area, allowing the villa’s indoor space to segue seamlessly outdoors with the balmy ocean breeze drawn in through folding glass doors. The infinity pool glitters under the tropical sun, while a poolside relaxation pavilion provides shaded reprieve and an opportunity to soak in the beauty and tranquility of the location. A private path meanders down the side of the hill directly from the villa grounds, down to a secret beach, adding an extra layer of privileged exclusivity to any stay at Villa Leelavadee. Intelligent design features include glass panels in the swimming pool that cast waves of sunlight onto the level below, bathing the games area with natural sparkles. A private gym, equipped with fitness machines and free weights, plus a personal sauna, ensure guests never have to leave the villa's captivating surrounds to stay in shape. To complement the indoor facilities, a private 13meter pool provides an opportunity to stretch and breathe in the clean island air while also enjoying the tropical vistas. At the end of a well-spent day, four expansive bedroom sanctuaries invite guests to relax in blissful seclusion. Outdoor whirlpools and bathtubs offer starlit soaks amid the privacy of secluded terraces, from where guests can also gaze out onto the horizon during the day and feel comfortably lost in paradise. Villa Leelavadee is tended by two discreet live-in staff: one chef and one housekeeper. The Samsara Estate front office team and villa concierge complement the villa's permanent staff to organize customized requirements and satisfy any holiday whims.